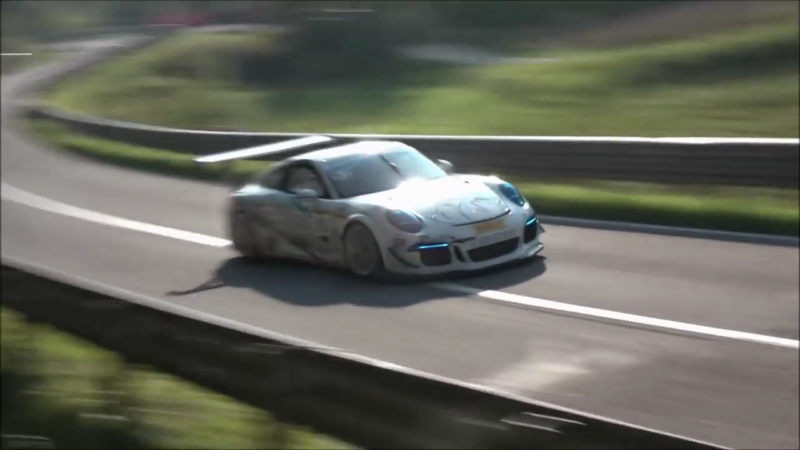 In the hands of a talented driver, the 991 GT3 Cup can truly do anything. Though a comparatively large car to exploit on a narrow hillclimb, Belgian ace Humberto Janssens shows us that it's more than capable. With supreme confidence in the Cup car, Janssens places the car accurately and consistently, and never had to wrestle with a recalcitrant rear; the Cup car puts all 500 horsepower to the pavement without any fuss. As speeds increase, the GT3 Cup gets to exercise the downforce advantage it holds over the competition. The Belgian, who is now a regular sight at Spanish hillclimbs, took this 9,000-rpm screamer to the FIA HillClimb Masters in Gubbio, Italy and shocked the audience with his performance. Despite not using a car nearly as specified for this racing format as some, Janssens nearly joined the ten fastest touring cars at this event. Years of racing a 944, before graduating into a 997 GT3, prepared the Belgian well for this incredible display. Though it might not be as spectacular as some of the wilder Porsche hillclimbers with similar power outputs, this 991 Cup's stability and enviable traction ensures a neat, tidy, and positive drive. Sometimes the subtly quick laps, the ones which lack all the fireworks, are sometimes the fastest.